Man With Van Hire Services provide Home to Home Removals within Sussex, Kent, Surrey and Hampshire and travel to any location nationwide. Our professional home to home removals team will blanket and secure all your belongings in transit. Our Moving Services are flexible as we recognize that home movers are faced with a lot of challenges during this stressful time. Man With Van Hire Services work closely with local storage companies to ensure affordable storage options that work to your timescales. We offer our home movers professional packing services to provide you with peace of mind. These range from partial packing to full packing services. Alternatively, you may want us to professionally pack your fragile items only like mirrors, artwork, glassware and china. I moved last Monday. Eco removal were on time, fast and friendly. Making a usually stressful time a absolute breeze. Dean kept in touch over the days running up, showing EXCELLENT customer service. I Can't rave about Eco van enough. I'm recommending them to everyone, they really understood my situation and tailored there services accordingly. The Boys turned up promptly and cheerfully undertook everything I threw at them! They moved furniture, took lots of stuff to the charity shops and other boxes to our storage units. They also disposed of rubbish and even broke old furnitre down so it could be taken to the rubbish tip. They put up with our grumbles (at life not at them) and worked straight through - no stopping for cups of tea. My move was completed by the lovely lady cleaners who rapidly cleaned the house from top to bottom as the contents were removed. Their help made an otherwise traumatic and difficult time pleasurable. And, it didn't cost a furtune - great value for money. 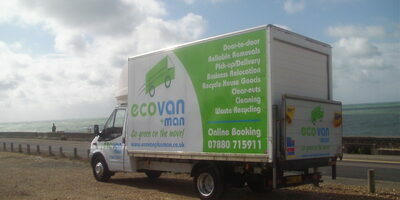 I certainly reccommend the Eco Van team to everyone whatever size the job.